Westminster council's hotel bill for putting up families waiting for housing has hit £3m in the last six months. "It cannot make sense to pay more for housing a family in one room than it would cost to house them in suitable self-contained accommodation." At the risk of stating the bleeding obvious, if the suitable self-contained accommodation was available then it's hardly likely Westminster would be forking out for hotel rooms in one of the capital's most expensive boroughs. Of course it makes more sense to provide affordable and decent accommodation for people on benefits or low incomes. But if we're going to cap benefits, have a property boom which only wealthy foreign investors can participate in, stop building social housing while selling off our existing stock and revel in the highest rents ever anywhere then something has to give. And that something is Westminster giving money to local hotels while its residents go into arrears and become homeless. 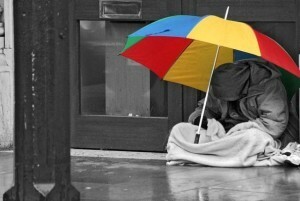 According to figures from Shelter, the number of homeless families in London increased by 23% from 2011 to 2012. With the new benefits caps being rolled out later this year, we won't be surprised to see the numbers rising. Photo by LondonSLR in the Londonist Flickr pool.